Yes, it's been a long, long time. I had been so good about recording things on this blog. Then, when the car came darned near completion ... well, I pooped out, preferring to sit in the old thing and tinker or just listen to the engine and watch the gauges. The restoration journal never got an update. Well, I'm back now. The interceding years  it's been since June 2011!  won't be covered in much detail, but I'll do what I can do. A first trip? To the gas station, of course! The big news is that the car is on the road, fully licensed and insured (I went with Hagerty). It's been legal on the road for over two years now, and I've driven a grand total of 110 miles. The initial voyage was about a mile up the road to the Rougemont BP. Arlene came with, and the car ran ... horribly. It sounded like a tractor (related details below) and it had very little power. It also sucked gas, so it was fortunate that we went to the gas station. In a restoration, you always do some things twice and a few things more than twice. In the last (now ancient) update, I mentioned that I had installed the convertible top. It fit snugly and well, I thought. But I must have done something wrong, since the darned thing ripped at two symmetrical points when I retracted the top. 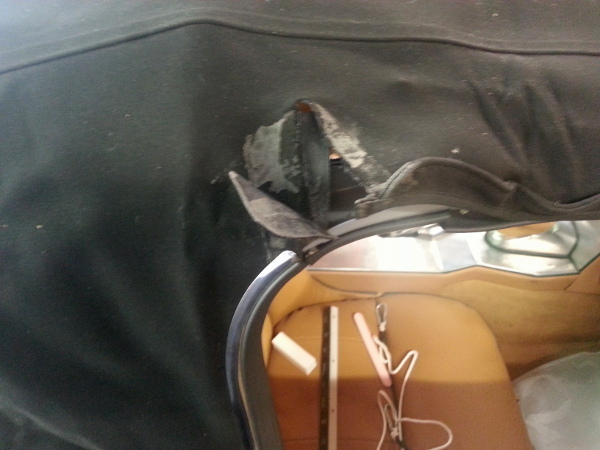 I still do not exactly know what the problem was, except perhaps that I had installed the top too snugly or that I had attached the top to the frame pieces inappropriately. The tension points appeared in the upper rear corner of the retractible door window frame, and I suspect that this area may be installed loose? I notice now that there was a cord sewn at the end of the rain trap immediately above the window frame, and I wonder if that was actually supposed to be the attaching point for the top at some point. I have to re-read the instructions I used to see if there was something I missed or misunderstood. I did try patching the tear, but it was not suitable, and in any case the patch came off the first time I retracted the top. At any rate, a new top is in order, and I think that I will probably go with a vinyl top  which, I am told, is more original. My eldest son, Derek, has a Honda S2000 (very nice car, by the way, and one that I have autocrossed), and it has a vinyl top. It is quite nice  and actually much nicer than I recall my older vinyl top was on the MG I had in college. Doing things over is all part of doing a restoration, either because things don't go back together as you'd think or because, well, Stuff Happens. People might recall that Bill McKenna began his restoration about when I did and also chronicled his progress for all to see on the web. (He finished his car quite a while ago, and it is marvelous.) He had redos and mishaps just as I did (as with the doors). I think you have to be a bit Stoic if you're going to take on a restoration and actually complete it, since progress gets interrupted and sidetracked. Then, there are the torsion bars on these cars. They are the best instructors of patience, persistence, and fortitude. Mo-Ma comes through for another delighted customer. Mo-Ma Manufacturing in Albuquerque, New Mexico (www.momamanufacturing.com) was my choice to get the old tachometer upgraded. I had removed the tach generator when the engine went in. I recall discussions on forums about the "dog" that drives the generator being flimsy and breaking and then falling into the oil system, threatening to jam pieces of itself into the oil pump. That didn't sound good to me. Besides, the technology has improved quite nicely, so that driving a tech off a coil is simple and accurate. Mo-Ma has a great reputation for workmanship and, as I learned, for customer service. I can't recall the lady's name I talked with, but we had a delightful and wide-ranging conversation. She has been in this business for years, starting off being the Smith's representative for the Western United States. 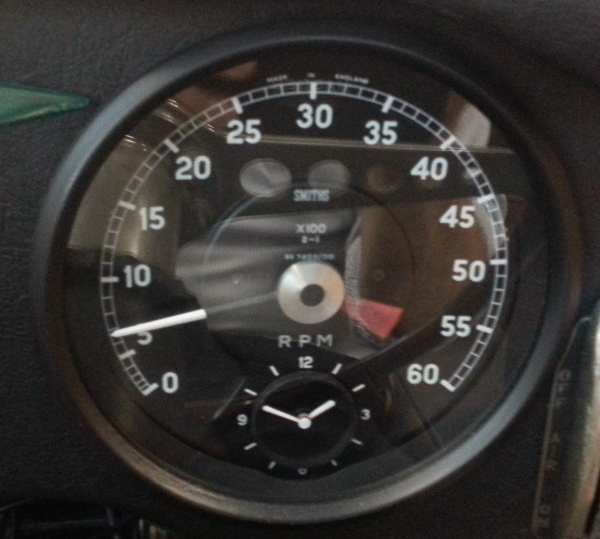 I sent the tach in, and I promptly got it back, all cleaned up and beautiful. It works beautifully. The business of restoration has a few characters who stand out, and I have to say that the woman who I talked with at Mo-Ma is among them. I recall Mike Moore (the one in California who's an enginer, not the film-maker) reporting that he had a nice telephone conversation with her, too. Exhaust pipes. Mufflers. Nicely chromed resonators. 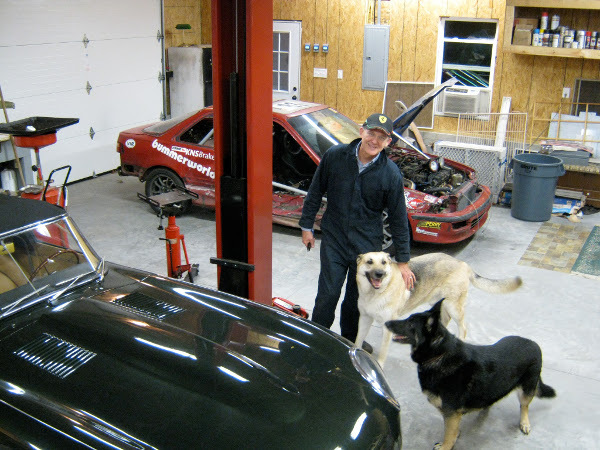 From summer 2013 to early 2014, the exhaust "system" consisted of a pair of Cherry Bomb glass packs and 2-inch conduit I had bought from Lowes and bent into shape in the old cramped garage. Or there was nothing at all from the manifold back, since I tired of the rudeness of the noise and removed the improvized exhaust system. I was set to get the Real McCoy. And so the car sat, sadly, waiting for a refresh. I bought the paired mid-car mufflers (Walkers, for those who are interested) and the resonators along with mounting hardware. I installed the mufflers and had the resonators ready, but I still hadn't acquired the connecting pipes. I even ordered them, but found out in a phone call that they weren't on hand. "Really," the fellow said, "just go to a custom exhaust shop and get some made. They'll cost about the same." Made sense. I cancelled the order. But ... I procrastinated. 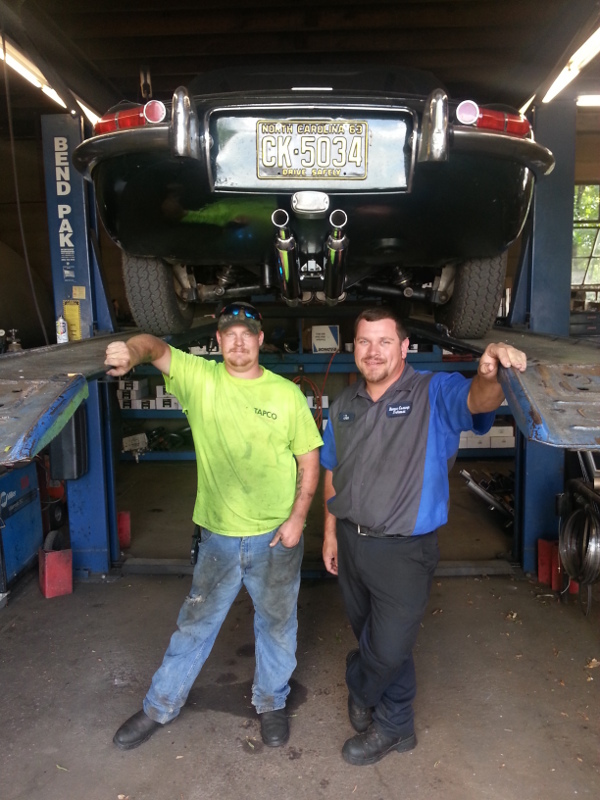 I had the fellows at REMCO Muffler Shop in Roxboro, North Carolina, do the pipes, and they did them well and with care. I actually made the decision to go with them after I learned that they had done work on an old '50s-era DKW. I figured if they would do that well (and the customer was very satisfied), an old Jaguar might be interesting to them and that they knew how to treat on old car with respect. They did a beautiful job, and they were great fun to work with on the project. And now there is a Garage Mahal  and maybe time for a different project? Most of the restoration of this 1963 roadster happened in pretty cramped quarters, made even more cramped by my inherent resistance to putting things away. Of course, there wasn't much space to put things away in! Fixed that. So now we have ample room, even for the dogs. Bringing this car back from the brink has been enormously gratifying (at least when it's not been enormously frustrating and challenging!). I now have a very fine car that still needs a tweak here and there, and that still requires some fettling now that it's on the road and I can gauge performance under "real conditions." I still have a couple of things to hook up, like the windshield wipers  which are, of course, useless anyway since the car never goes out in the rain now. But I find that I'd like to start a new project and find a new challenge. 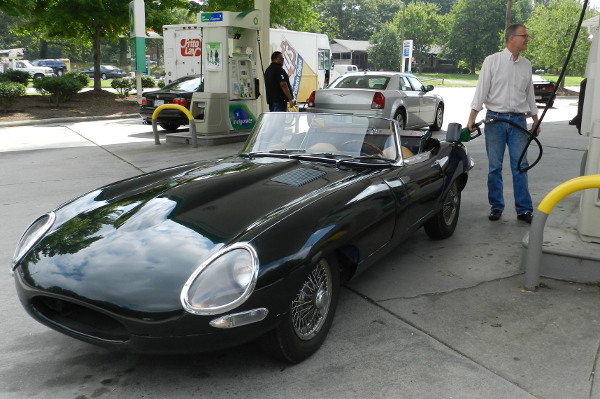 I am nearly committed to selling the Jaguar E-type that I've had such fun with over the years. I wanted one of these cars since I first put together a model of a coupe when I was in fourth grade, and now having it, I find that perhaps my interest is really in the putting together and not in the possession. (Haben oder Sein, Erich Fromm once asked.) As a matter of fact, that little discovery may have been the most profound over the years. So, who knows what will happen in coming months.